B everly Washburn was back in Cherry Hill, New Jersey on Saturday night March 14 where she appeared at Rick Saphire's Magic Shop. It had been two and a half years since her last appearance there, and Helen and I were glad to see her again. Rick has been her manager for many years, and it was he who invited her to speak at his New Jersey shop. The tickets were $20.00, and with the price of admission everyone received an autograph picture. The show went from 8:00pm to almost 10:00pm. The small theater, which was located in the back of the shop, can hold about 35 people and all the seats were filled. They were set up in rows, but even though every seat was taken, each person had a very good view. Friends, family and fans came as far as Lancaster, Pennsylvania just to spend Saturday night listening to Beverly speak. One of whom I speak of was Jim Nolt who hosts this website, The Adventures Continue. Beverly shared her personal reflections and feelings with us. It was a walk down memory lane. 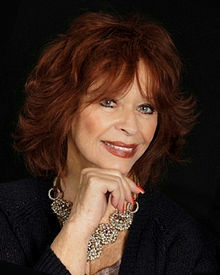 Rick had many clips of Beverly’s work. When we watched them Beverly spoke about her experience on those particular clips. Audience members were encouraged to ask questions during the evening and Beverly addressed each and every one. During the session, Rick chose an audience member to participate in reenacting a scene from Old Yeller. That was fun to watch, and everybody enjoyed Beverly's humor. Beverly is a voice for abandon pets, and she wrapped up the evening with a heart touching poem about a dog that was abandoned by his owner. She would love to rescue all the abandoned dogs in shelters. 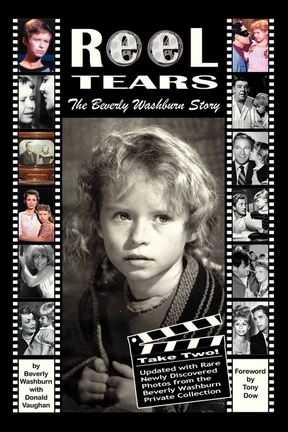 After she dried her eyes, she continued to chat with audience members and sign copies of her book, Reel Tears Take Two. We had to leave, but before we left I got my copy of her book and Beverly hugged us and said she really appreciated our being there. It was a long evening but it was a very nice presentation. I hope Beverly takes this Nostalgia Show to other areas. Fans would appreciate her stories and warmth.